« Nevertheless she is persisting. Oral arguments on Freyd case April 11, 2PM. The National Collegiate Athletic Association (NCAA), a nonprofit that regulates college sports in the U.S., oversees a $13 billion college sports industry powered mostly by its premier league, Division I. The University of Oregon and Oregon State make millions off lucrative TV contracts, ticket sales and apparel deals. The 2018 budget for the University of Oregon athletic department, fueled almost entirely by men’s football and basketball, was $113.2 million. 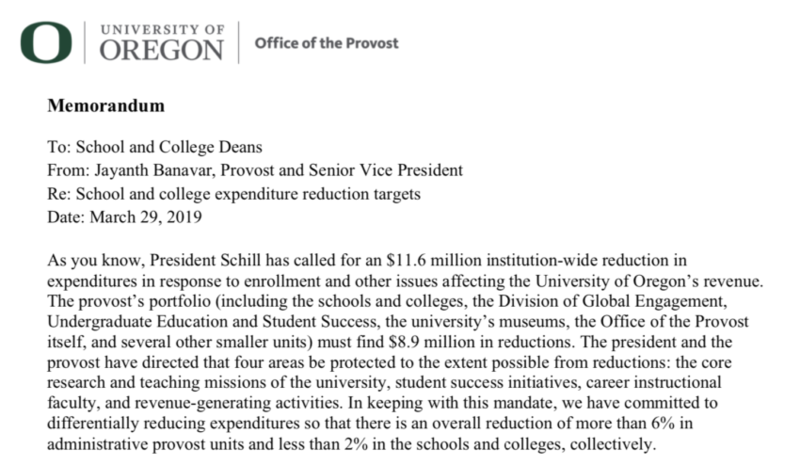 The large amounts of revenue generated by college athletics stand in contrast to the frugality of academic departments at Oregon’s public universities, which decry the continual decline in state funding for tuition. In an era of record student loan debt and escalating tuition fees, academic departments are trimming costs wherever they can. But athletic departments continue to spend freely and even accept money from academia that could fund academic programs. Oregon Business examined their budgets and contracts, received through public-records requests. The University of Oregon athletics department reports to the NCAA that it doesn’t get any funding from student fees. But in fact, the department’s critics say students pay athletics a combined $5 million a year at the very least. One of these financial arrangements governs revenue from ticket sales. All students chip in to watch sports, whether they’re fans or not. In 2017 the student government paid $1.7 million for tickets to games. The amount is specified each year in a contract between athletics and the school senate, a governing body representing the interests of students and faculty. The money comes out of the student government budget, funded by part of a mandatory $250 student fee. The academic budget also pays around $2.2 million (as of 2014-15) for student-athlete tutoring. This service comes at a much higher cost than tutoring for nonathletes. Athletes get their tutoring inside a $41.7 million modernist cube called the John E. Jaqua Center. The university drops $4,000 a year on academic support for each athlete, according to a 2014 University of Oregon senate estimate. Nonathletes get $225 each. The academic side also remains on the hook for athletics subsidies it agreed to in a 2009 memorandum of understanding that then-president Dave Frohnmayer signed with the athletic department. Nike founder Phil Knight donated a portion of the funds for the Matthew Knight Arena, a new basketball stadium, but the university paid $22.2 million using tax-exempt general obligation bonds for the land. The athletic department couldn’t pay all of the debt service on the land and facility, so they turned to academics. Consequently, roughly half a million dollars comes out of the academic budget each year for a quarter of the debt service on the bonds. Another $375,000 a year pays for luxury box seats for the university president, and more goes to debt on an underground parking garage. When will we cut some vice presidents, vice provosts, vice deans, vice associate deans, vice assistant deans and vice assistant directors? oh never? ah I get it. alright, move on, nothing to see here. Also, how about their assistants and assistant assistants? How about the ever expanding overloads for these folks? At least a consultant probably wasn’t paid to write the memo. All the second assistant vice admiral lower deans should just get titles that more accurately reflect their job duties, like apprentice Turd Polisher. President Schill’s March 19th memo said 3% for administrative units and 2.5% for academic units. This is saying 6% for admin and less then 2% for schools and colleges/academic units? 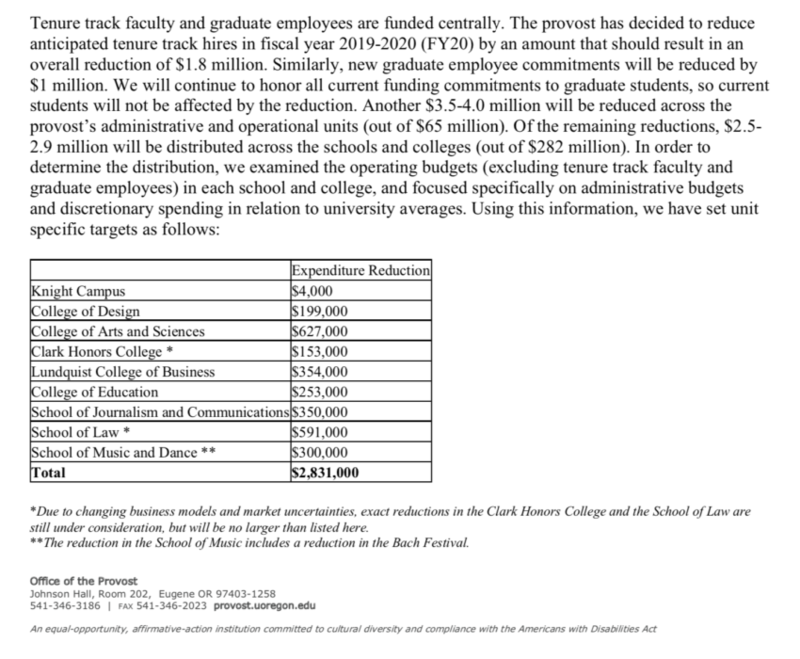 Am I understanding this correctly, that the Provost memo reflects a significant shift in the allocation of the cuts? To be honest, those cuts look tiny. Just don’t fill a hire or two. Am I missing something? Who is really getting affected by this? What does 4 million in cuts to the provosts administrative and operational units mean? I’m guessing they don’t look so small to those without tenure or good friends in JH. To our brothers and sisters making under 30,000/yr, these cuts can be frightening. And these positions, are the ones that are unlikely to get filled. This adds MORE work to those who stick around. The $150-500k/yr positions, will obviously be re-filled post-haste.